When looking into updating the flooring in your home, there are some areas that often get overlooked. Garages, basements, and even patios sometimes fall by the wayside in the search for improvement. This unfortunately undercuts the potential these rooms have, even with the inherent benefits of concrete floors. Many people don’t realize that a properly resurfaced floor in any of these areas goes a long way in bringing together the style of your home, especially when it comes to concrete staining. Concrete staining adds durability, class, and beauty to any room through its vibrant color selection and unique material styling. There’s no shortage of options when choosing the right decorative staining design for you. Texas Premier Coat Resurfacing in Austin, TX, wants to show you how much your concrete flooring can be enhanced with such a simple, cost-effective process. Call us and bring new life to your concrete floors. Turn your dusty basement into a new game room, study area, or even bar! 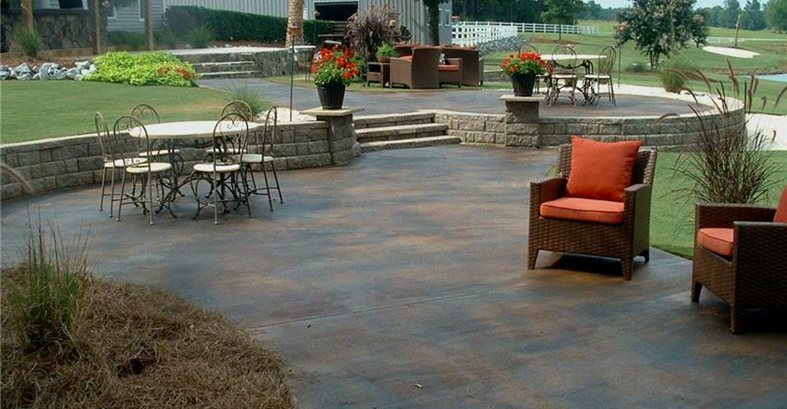 To do this, you’ll need a classier look than the plain, off-white or grey slabs of concrete found in most homes. That’s why concrete staining is your best solution for affordable, effective treatment of your concrete flooring. Staining does wonders for revitalizing old living spaces like basements, garages, and patios, especially those constantly exposed to harsher conditions like heavy traffic or the ever-changing weather. 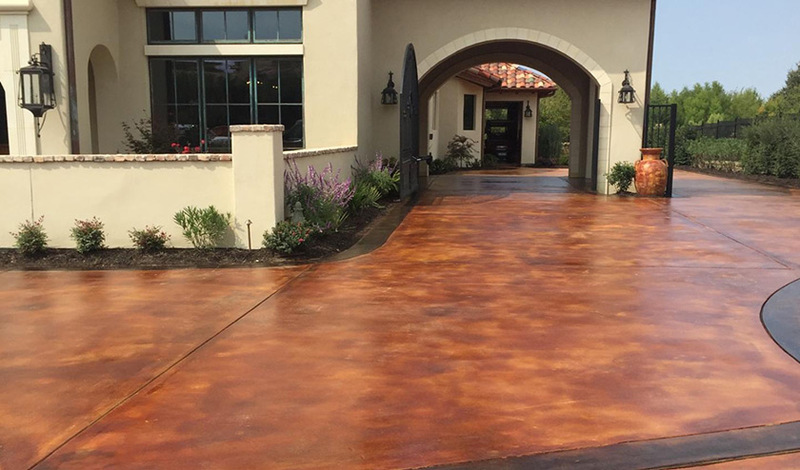 Because of this, Texas Premier Coat Resurfacing offers a decorative driveway service or walkway staining as well. Subtle blue hues, yellows, browns, golds, and more are all available to make your concrete floor bloom with personality. Concrete staining is versatile and able to recreate the look of numerous materials, such as marble, leather, wood, and stone. The two major types of staining categories are acid stains and water-based stains, each utilizing their own methods for infusing color into your floor. Concrete staining is also semi-transparent, meaning that it accentuates and revitalizes the flooring with a soft glow, rather than washing out its textured complexities. No matter which staining option you decide on, you’ll be left with a rich, luxurious floor that exudes professionalism, and will impress both friends and family. Aside from being undeniably cheaper than other flooring considerations, concrete staining is known for its hearty fortitude. While paint easily scratches and peels off over time, stains are abrasion resistant and refuse to scuff or fade out. This is because the bonding of the stain to the floor is incredibly resilient. It means even into the distant future, you and your friends can look forward to enjoying your brilliant colored staining with little hassle or maintenance. The concrete staining process also won’t hold any dust, mold, or allergens, meaning those with particularly bad allergies won’t need to worry. Let the staining artists at Texas Premier Coat Resurfacing bring your tired concrete floors back into the realm of color brilliance. 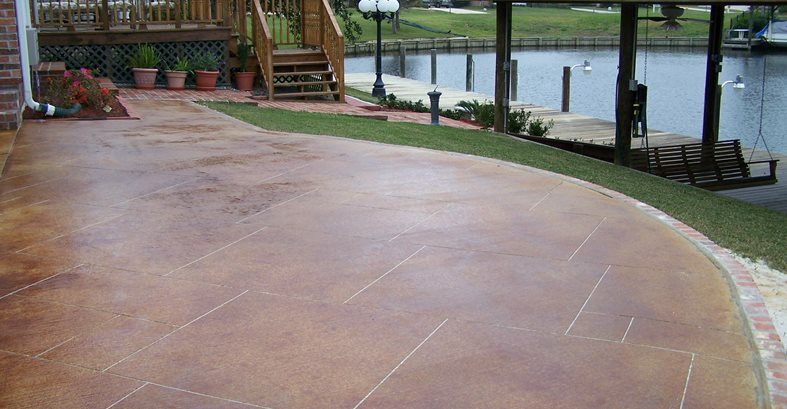 Call us at (512) 461-4836 for a free estimate and to learn more about concrete staining.